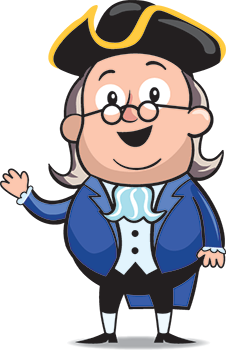 The inspiration for the Ben character comes from Benjamin Franklin (1706-1790), who, like Thomas Jefferson and George Washington, was one of the most important individuals in early colonial and United States history. As a young boy, Ben worked as an apprentice in a print shop and later went on to draft some of the Nation’s most significant documents. Although he lived before GPO’s founding, his legacy of publishing information lives on in what we do today. Who was Ben Franklin? Preparing to use Ben's Guide.